While the pineapple pizza debate has raged across the internet, drawing politicians and celebrity chefs to the frontlines, as well as encouraging a small amount of guerilla warfare, something even more nefarious has been lurking in the depraved heart of at least one individual. Peeps on pizza. Peepsza. Catch your breath. Then look at the hilarious terror one tweeter unleashed on the world. Barf bags are in the seat-back pocket in front of you. Those are the sugary little marshmallow candies seen at your local supermarket every Easter melting their way into an otherwise perfectly fine pizza. Braun has ignited serious opinions online just by sharing this photo. There's a lot of disgust out there for this unholy scourge. @AustinOnSocial Thanks, I wasn't sure what was going to be the first thing to make me retch this morning. Now i know. 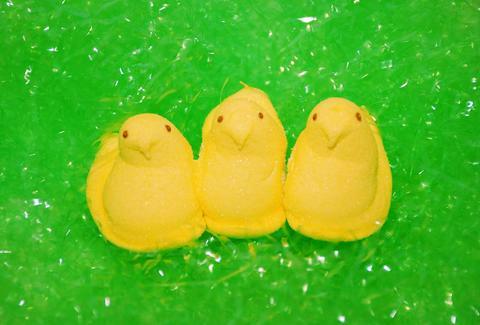 @clintisweird I can't believe someone sat there and placed the Peeps on the pizza like... they deserve to go to prison ! @AustinOnSocial ... what have you done?! All of this has been quite shocking for the faint-hearted, no doubt. But here's where things reach the apex of head-scratcher mountain: A scary number of people -- aka more than zero -- want to eat this pizza, which is undoubtedly an entire ring of Dante's hell. @AustinOnSocial I mean this looks awful but yes it is better than pineapple pizza. I'm starting to see profit in this! One question for anyone who wants to eat this: Why? Is it morbid curiosity? Do you genuinely think it might be good? The rest of us just want to understand why you feel the way you feel. Dustin Nelson is a News Writer with Thrillist. Whatever. He'd try it. Follow him @dlukenelson.